Using the strengths of their individual artistry, Westlake & Lior find common ground to express the wisdom of compassion through a combination of music & ancient writings. &apos;Compassion&apos; draws from the rich worlds of Judaism and Islam to present a collection of profound and poetic messages surrounding the idea of compassion between human beings. The texts are largely a collection of poems, proverbs and songs that give us an insight into such wisdom. Their similarities are immense and their universality is undeniable. &apos;Compassion&apos; is a 45 minute song cycle for solo voice and symphony orchestra. The piece inhabits a vast array of emotions & colours, at times pulsating and visceral, at others reflective and textural, and draws upon the myriad of influences that Westlake & Lior have been able to bring to the table from their incredibly diverse backgrounds. Lior is one of Australia&apos;s most cherished singer / songwriters. He burst on to the Australian music scene in 2005 with his stunning debut album — &apos;Autumn Flow&apos;. Recorded and released entirely independently, the album became one of the most successful independent debuts in Australian music history. Lior has released a further four albums since and is a 7 time ARIA nominee including Best Male Artist. Most artists set out with an ambition to build a career based on musical credibility and integrity whilst maintaining an independence and individuality in their craft. Lior is certainly part of that rare breed that has achieved this whilst garnering a great degree of success and critical acclaim. 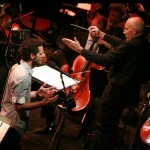 Nigel Westlake is one of Australia&apos;s most respected composers. Recently awarded an Honorary Doctorate in Music from the University of New South Wales, his compositions have earned many accolades, including the Gold Medal at the New York International Radio Festival, 15 APRA awards and the prestigious Paul Lowin Orchestral prize in 2013. His film score credits include Miss Potter, Babe, Babe: Pig in the City, and the IMAX films Antarctica, Imagine, The Edge & Solarmax. He has conducted all the major Australian symphony orchestras in recordings & performances of his own works.